Crawfish Boils are wonderful messy affairs that are best suited for the outdoors. Boiling crawfish is a festive event and eating is also thirsty work, so we made sure to have lots of beer on hand. What looks, tastes, and smells like seafood, but doesn’t come from the sea? It’s crawfish, a freshwater shellfish that is considered a Louisiana delicacy. Nothing else symbolizes the Cajun (a person of French Canadian descent born or living along the bayous, marshes, and prairies of southern Louisiana) culture of Louisiana like crawfish. Crawfish have become synonymous with the hardy French pioneers who settled in the area after being forced by British troops to leave their homes in Nova Scotia. Crawfish (or crayfish) resemble tiny lobsters. They are also known in the south as mudbugs because they live in the mud of freshwater bayous. They are more tender than lobsters and have a unique flavor. Today crawfish are raised commercially and are an important Louisiana industry. Most of the crawfish consumed in the United States are from Louisiana, although people from other states consider them a delicacy, too. Locals still hold the traditional crawfish boils, where friends and family gather to feast on pounds of crawfish. In the spring, families will go out fishing on the bayous or crawfish farms in an age-old tradition that thrives to this day. The local Indians are credited with harvesting and consuming crawfish before the Cajuns arrived. They would bait reeds with venison, stick them in the water, then pick up the reeds with the crawfish attached to the bait. By using this method, the Indians would catch bushels of crawfish for their consumption. By the 1930s, nets were substituted, and by the 1950s, the crawfish trap was used. On July 14, 1983, Louisiana’s governor approved a law designating the crawfish as the state crustacean. Louisiana thus became the first state to adopt an official crustacean. That is how serious Louisiana is about their crawfish! Crawfish are descendants of the Maine lobster. After the Acadians (now called Cajuns) were exiled in the 1700s from Nova Scotia, the lobsters yearned for the Cajuns so much that they set off cross the country to find them. Whole mushrooms, Green Beans, etc. * Use overnight delivery for live crawfish. You should order the crawfish to arrive the day before or the day of your crawfish boil. See below to determine how many pounds of live crawfish you will need to order for. ** Crawfish Boil Seasoning - Also known as crab or shrimp boil seasoning. Can be found online or in the seasoning or seafood section of any grocery store. There are many manufacturers to choose from. This is a spice blend of salt, cayenne pepper, garlic powder, onion powder, lemon juice, and additional spices. One pound of crawfish boil seasoning will cook approximately 12 to 15 pounds of crawfish. 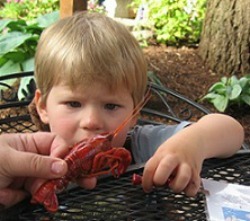 Live Crawfish - Plan on ordering about 2 to 3 pounds of crawfish per person or 4 to 5 pounds for a heavier crawfish eater. Some people are extra-heavy eaters. For them you will need 5 to 7 pounds. 60 quart boiling pot link - One large Stainless-Steel Boiling pot (60 to 80 gallon) with basket insert, and lid. You can use your Deep-Fat Turkey Fryer - will cook about 10 to 15 pounds of crawfish per batch. As you can see from the photo of the boiling pots on the right, John boiled up many sacks of live crawfish for this party. A large paddle for stirring the crawfish. A large picnic table with plenty of newspapers to cover it, several rolls of paper towels, and a large garbage can. Crawfish season is from late February to mid-May. You must keep the live Crawfish fresh and healthy. Keep them in a cool place and out of the heat. Your garage is the perfect spot until you're ready to boil. When you receive your sacks of crawfish, simply take your sack of crawfish, hose them down, and place them back in a cooler (or the box the sacks arrived in) with a bag of ice. 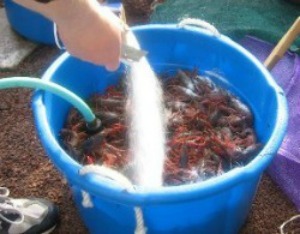 Do not take the crawfish out of the sack, leave them in the sack and hose the entire sack with fresh water. If you use ice, be sure to drain them frequently. DO NOT let them sit in cold water for a long time or they will die! Keep live crawfish at 36 to 46 degrees F. for approximately 3 days with wet burlap sacks, towels, etc. on top. Let crawfish return to room temperature before using. Do not leave the crawfish outside if the temperature is freezing level or below! When traveling with crawfish, a few of them will die naturally due to stress of being moved, etc. One thing to remember is that crawfish are also called crawfish mud-bugs. The cardinal rule is to purge and thoroughly wash the crawfish before boiling them. Pour the sack of live crawfish in a plastic children's pool, large tub, or a large ice chest. Pour one (1) 26-ounce box salt over the top of the crawfish. Add water to just cover the crawfish. Gently stir with a large paddle to mix the salt and the water. Stir for 3 minutes, then rinse crawfish. NOTE: some people skip adding salt - your choice. Be careful not to let them purge too long. You do not want them to be dead when you add them to the boil. Throw away all crawfish that have already died (the dead crawfish should float to the top). You do not, I repeat, DO NOT want to add dead crawfish to the pot.After purging and cleaning, do not leave the crawfish covered with water, as they need air to stay alive. Keep the crawfish in a cool or shaded area until you are ready to start cooking. If you have not already done so, drink a cold beer. In a large (60- to 80-gallon) pot over high heat, add enough water to fill a little more than halfway. Squeeze the juice out of the lemon halves into the water and throw the lemon halves into the water. Add crawfish or crab boil seasoning. Cover pot, turn on the burner full blast, and bring water to a boil; boil 2 to 3 minutes to allow the spices to mix well. NOTE: It needs to be hot enough to bring the pot to a rolling boil in about 15 minutes. Using a large wire basket that fits into the pot, add onions, sausage, mushrooms, potatoes, and any other vegetables you desire. Maintain a boil and cook 10 minutes or until potatoes are tender. Add crawfish to the wire basket, stirring them a bit. Once the water starts a rolling boil again, boil 5 minutes. Regulate the burner so the rolling boil is maintained, but where the pot does not boil over. Turn the burner off, keep the pot covered, and let the crawfish soak for 20 to 30 minutes. Remove wire basket from pot. 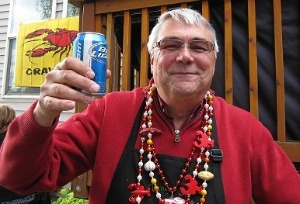 Now it is time to sit down and relax with a beer as the crawfish cook. Remove the strainer from the water, and rest it on the top of the pot using two boards laid on the top of the pot as a rack. Let the crawfish drain. To serve the traditional way, cover a table (preferably outdoors) with thick layers of newspaper. Spill the contents of the basket (onions, potatoes, sausage, mushrooms, green beans, and crawfish) along the length of the newspaper-covered table. They are best served steaming hot. If you want the crawfish more spicy, you can add additional seasonings at the table. The following fellow crawfish eaters graciously allowed me to take their photos while “sucking crawfish.” Thank you for being such good sports! 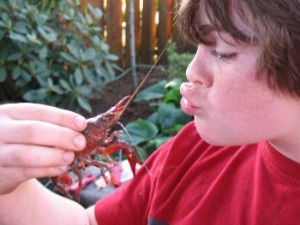 Had a delicious blast this weekend using your Cajun Crawfish Boil recipe, but with live California Crawfish (which are harvested from Sacramento Delta)…. just as good! The key thing I would have missed without reading your web page was “purging” the crawfish. We improvised with a 10 to15 gallon clean plastic garbage bin and a garden hose. Did not mention peeling crawfish before eating. Some friends from North Dakota ordered crawfish from Louisiana Crawfish Company and had a boil. They ate crawfish in their shells.